Our dedicated team comprises of skilled water damage restoration professionals who have firsthand knowledge and unmatched expertise in water damage cleanup services. We are just a phone call away, contact us now and we would reach your place shortly. Making use of industry best and state of the art technology, our team is equipped with everything needed for your water damage repairs to ensure you get the best results possible. In order to manage your water damage cleanup efficiently, we make use of cutting edge equipments such as moisture detectors, hygrometers, infrared cameras to mention but a few. Additionally, commercial air movers and submersible pumps are also available to handle your commercial projects. Thus, we have everything needed for your water removal and reduction of humidity from your place. Once we are done with the drying process, we begin the restoration and proceed efficiently to ensure flawless restoration. We complete the task in the best way possible and leave your place in an improved condition. We provide top-notch water damage repair services at a very reasonable price. We offer timely services and help to save your stuff including carpets, drapes, furniture and other items. If water has caused irreparable damage and you need to replace your furniture, we offer complete assistance in making arrangements for replacement as well. Choosing our restoration services would be very favorable for you as we provide the best results possible more than any of our competitors in Orange County. We are a full-service water damage restoration company. Our professional efficiency along with the incorporation of latest technology makes us a more reliable option and we offer services all over Orange County. If you ever experience water damage at your office or residence, don’t panic. 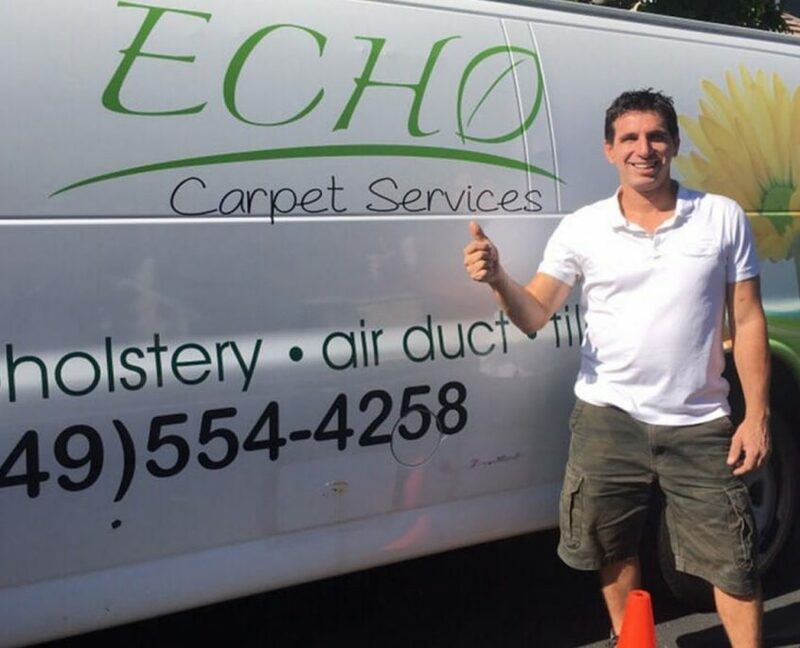 Just contact ECHO CARPET as soon as possible and we would arrive at the spot right on time to handle the situation. No matter how minor and major the water damage is, we can set everything right for you. On the other hand, we offer 24/7 emergency service and our team is ready to help you anytime around the clock. Our highly skilled technicians will first access the situation and determine what actions are required for restoring the damage caused by water. The Fundamental steps required for water damage restoration. If you encounter water damage at your office or residence, you don’t have to panic. Just contact us at ECHO CARPET as soon as possible and we would arrive to rescue your home or business as quickly as possible. No matter how minor and major the water damage is, we will handle the situation perfectly without any traces of water damage. For emergency services, our team is available 24/7 to respond to you at anytime around the clock. Our highly skilled technicians will first access the situation and determine what actions are required for restoring the damages caused by water. In case of water damage, it is very important to remove the standing water and control the damages as soon as possible. That’s why we are always available to help you through the entire process. Our staff will remove the rugs, clothing and other wet items and assist in completing the drying process in a more efficient manner. Our team of experts makes use of top-notch professional equipments such as air movers and heaters to facilitate and quicken the drying process. To ensure complete drying, we offer careful monitoring of your place for a number of days and provide guaranteed satisfaction. Once the drying process is complete, one of our experts will come to your place and inspect your property to further to ensure the moisture is completely removed and there are no chances of mold growth. After your place is completely dried, we will begin to reconstruct the damaged structure and replace the stuffs if required.